The United States has long accepted refugees fleeing persecution or war. From taking in hundreds of thousands of Europeans displaced by World War II to welcoming those escaping from Communist regimes in Europe and Asia during the Cold War, the United States has helped define protections for refugees under international humanitarian law. Beginning in 1980, the U.S. government moved from an ad hoc approach to the permanent, standardized system for identifying, vetting, and resettling prospective refugees that is still in use today. The size of the U.S. refugee program has often fluctuated. But the war in Syria and the resulting migration crisis in Europe has increased policymakers’ scrutiny of arrivals from the Middle East, beginning with the administration of President Barack Obama. President Donald J. Trump ratcheted up that scrutiny with a ban on refugees from certain countries and sharp cuts to overall refugee admissions, renewing debate over the national security implications of refugee policy. There is sometimes confusion between the terms migrant, refugee, and asylum seeker. Migrant is an umbrella term for people leaving their homes and often crossing international borders, whether to seek economic opportunity or escape persecution. As defined by U.S. law as well as the 1951 Refugee Convention, refugees are migrants who are able to demonstrate that they have been persecuted, or have reason to fear persecution, on the basis of one of five “protected grounds”: race, religion, nationality, political opinion, or membership in a particular social group. Watch: What’s the Difference Between a Migrant and a Refugee? Under the U.S. system, refugees are those seeking entry from a third country. Asylum seekers are those who meet the criteria for refugee status but apply from within the United States, or at ports of entry, after arriving under a different status. Asylum seekers follow a different protocol than those applying for refugee status. For how long has the United States accepted refugees? The United States has long accepted migrants who would be identified under current international law as refugees. In the wake of World War II, the United States passed its first refugee legislation to manage the resettlement of some 650,000 displaced Europeans. Throughout the Cold War, the United States accepted refugees fleeing from Communist regimes, such as those in Eastern Europe, China, and Cuba. But the country’s official federal effort to resettle refugees, the U.S. Refugee Admission Program (USRAP), was not created until passage of the Refugee Act of 1980. Prior to 1980, legislation that authorized acceptance of refugees was passed primarily on an ad hoc basis, responding to ongoing mass migrations. After the fall of South Vietnam to Communist forces in 1975, when the United States began taking in hundreds of thousands of Southeast Asian refugees, Congress saw the need for a more standardized system. The 1980 legislation, signed by President Jimmy Carter, established permanent procedures for vetting, admitting, and resettling refugees into the country, incorporated the official definition of the term “refugee,” increased the number of refugees to be admitted annually to fifty thousand, and granted the president authority to admit additional refugees in emergencies. How many refugees are allowed into the country? The number of refugees admitted into the United States has generally declined from more than 200,000 at the start of the program in 1980 to approximately 22,500 in 2018. Levels of refugee admissions fluctuated dramatically during that period, falling through the 1980s and spiking again in the 1990s after the collapse of the Soviet Union. Annual numerical ceilings on refugee admissions are proposed by the president and require congressional approval. Following the 9/11 attacks, President George W. Bush suspended refugee admissions for several months, citing national security concerns. From 2001 to 2015, caps on refugee admissions stayed between seventy thousand and eighty thousand, though both the Bush and Obama administrations regularly admitted fewer people than the ceilings allowed. In 2016, President Obama increased an earlier approved ceiling of eighty thousand to allow an additional five thousand refugees as part of an effort to address a growing migration crisis caused by worsening conflict in Syria. Obama also proposed that the United States set a ceiling of 110,000 refugee admissions for fiscal year 2017. President Trump reversed President Obama’s proposed ceiling by capping the number of refugees allowed into the country in fiscal year 2017 at fifty thousand. He lowered this ceiling further for 2018, to forty-five thousand, and again for 2019, to thirty thousand, by far the lowest cap since the introduction of the program. The Trump administration argued that the reduction was necessary to direct more government resources to the backlog of applications from nearly eight hundred thousand asylum seekers who had reached the United States’ southern border. Critics counter that the asylum and refugee programs have little bearing on one another. The United States has consistently received refugees from Asia, Africa, Europe, and Latin America, though the total number of admissions has changed dramatically for some regions in the time since the U.S. refugee resettlement program was created. Immediately following passage of the 1980 act, more than two hundred thousand refugees—the highest total in recent history—were admitted to the country; the vast majority originated in Southeast Asian countries, including Cambodia and Vietnam. Refugees admitted to the United States from former Soviet countries increased sharply for the decade beginning in 1989, and from 2006 to 2016, the highest number of refugees came from Myanmar, Iraq, and Bhutan, in descending order. In 2018, the countries with the highest number of refugees admitted to the United States were the Democratic Republic of Congo, Myanmar, Ukraine, and Bhutan, in descending order. A January 2017 executive order by President Trump called for temporarily prohibiting the entry of nationals of seven Muslim-majority countries—Iran, Iraq, Libya, Somalia, Sudan, Syria, and Yemen—a tightening of visa restrictions on those countries imposed by the Obama administration. It also indefinitely barred all Syrian refugees. The Trump administration revised the order twice amid legal challenges to the so-called travel ban, and in April 2018 the Supreme Court allowed the third version of the order to stand. Trump also heavily criticized a resettlement deal with Australia finalized by Obama, in which the United States would take 1,250 refugees currently being held by Australian authorities in offshore detention centers. Many of these refugees are from Iran and Somalia, countries included in the third iteration of the travel ban. By September 2018, Washington had resettled just over 350 refugees; applicants from Iran and Somalia had been rejected. How are refugees screened and approved? The U.S. State Department, in consultation with a constellation of other agencies and organizations, manages the process through its refugee admission program, USRAP. The first step for a potential refugee abroad is most often to register with the UN High Commissioner for Refugees (UNHCR). UNHCR officials collect documentation and perform an initial screening and then refer qualifying individuals to U.S. State Department Resettlement Support Centers (RSCs), of which there are nine around the world. Sometimes this referral is done by a U.S. embassy or a nongovernmental organization. The admissions process generally takes from eighteen months to two years to complete. Then, RSC officials interview the applicants, verify their personal data, and submit their information for background checks by a suite of U.S. national security agencies. These security checks [PDF] include multiple forms of biometric screening, including cross-checks of global fingerprint databases and medical tests. If none of these inquiries produce problematic results, including criminal histories, past immigration violations, connections to terrorist groups, or communicable diseases, the applicant can be cleared for entry to the United States. The admissions process generally takes from eighteen months to two years to complete. What government agencies are involved? The three primary federal government agencies involved in the refugee resettlement process are the State Department, the Department of Homeland Security (DHS), and the Department of Health and Human Services (HHS). The State Department’s Bureau of Population, Refugees, and Migration (PRM) is the first U.S. government point of contact; it coordinates the process with all other agencies until a refugee is resettled. Through its Citizenship and Immigration Services (USCIS) branch, DHS is the primary agency responsible for the security vetting of refugee applicants; USCIS makes the final determination on whether to approve resettlement applications. Its security review uses the resources and databases of numerous other national security agencies, including the National Counterterrorism Center, FBI, Department of Defense, and multiple U.S. intelligence agencies. Once settled in the United States, refugees are generally in the hands of charity and other volunteer agencies that specialize in resettlement. The State Department’s Reception and Placement Program provides funding to go toward refugees’ rent, furnishings, food, and clothing. After three months, this responsibility shifts to HHS, which provides longer-term cash and medical assistance, as well as other social services, including language classes and employment training. Following the reductions to the refugee admission ceiling, all nine nongovernmental agencies that assist with resettlement have downsized, closing offices or laying off staff. Several intergovernmental organizations play a crucial role at various points. The United Nations is primarily responsible for referring qualified applicants to U.S. authorities, while the International Organization for Migration coordinates refugees’ travel to the United States. 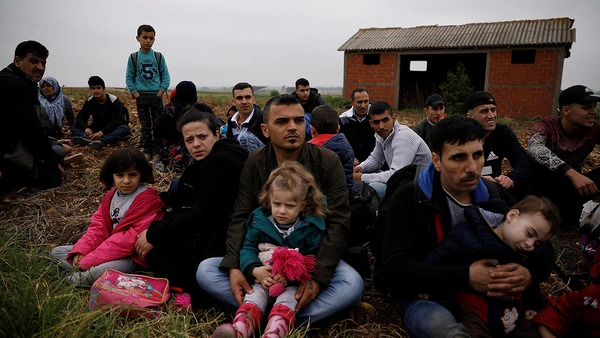 Refugees are resettled in one of approximately 190 communities across the country, though there are several states that generally resettle higher numbers than others. According to the State Department, Texas, Washington, and Ohio took in the highest number of refugees in fiscal year 2018, making up 20 percent of all refugee admissions that year. The ten states with the highest intake resettled just under half of all refugees admitted in 2018. Two states—Hawaii and Wyoming—took in no refugees. What roles do state and local governments play? The logistics of refugee resettlement are largely handled by nine domestic resettlement agencies, many of them faith-based organizations such as the Church World Service and the U.S. Conference of Catholic Bishops. Representatives of these organizations meet and review the biographical data of the refugees selected by the State Department’s Refugee Support Centers abroad to determine where they should be resettled. As part of this process, federal law requires that resettlement agencies consult with local authorities [PDF], including law enforcement, emergency services, and public schools. While this consultation is required, the 1980 Refugee Act gives the federal government ultimate authority over both whether to admit refugees and where they should be resettled. In the wake of the 2015 terrorist attacks in Paris, which were carried out by EU citizens who may have returned to Europe from the Middle East via refugee flows, more than thirty U.S. governors protested the resettlement of any Syrian refugees in their states. Legal experts say that while states cannot directly block federal government decisions on where to place refugees, they can complicate the process by directing state agencies to refuse to cooperate with resettlement agencies, as the governors of Texas and Louisiana did. Have refugee populations posed security risks to the United States in the past? Out of the more than three million refugees accepted by the United States over the past four decades, a handful have been implicated in terrorist plots. According to a 2016 study by the libertarian-leaning CATO Institute, of the 154 foreign-born terrorists that committed attacks in the United States since 1975, twenty were refugees. Of these attacks, only three proved deadly, and all three took place before 1980, when the Refugee Act created the current screening procedures. Many of those responsible for recent attacks have been U.S. citizens, including the 2016 Orlando nightclub shooter, one of the perpetrators of the 2015 San Bernardino attacks, and the 2009 Fort Hood shooter. The 9/11 hijackers were in the country on tourist or business visas. Others were the children of asylees, including the 2016 Manhattan bomber, whose father had been an Afghan refugee, and the Tsarnaev brothers, whose parents fled war-torn Chechnya. This 2017 report from the Pew Research Center examines recent trends in refugee arrivals. Refugee arrivals to the United States increased dramatically after the 1980 Refugee Act, explains this 2016 Congressional Research Service report [PDF]. President Trump’s executive order on immigration reshapes the nation’s refugee policy in significant ways, explains this New York Times article. This U.S. State Department graphic [PDF] illustrates the multi-step vetting process that all refugees must pass through before being admitted into the country. President Trump’s executive order misunderstands how to most effectively fight foreign terrorism, argues Jacob N. Shapiro in Foreign Affairs.